Pizza has to be one of my favorite meals to serve at a casual dinner party: Everyone likes to get involved in the preparation, so you can spend more time chatting up guests. Plus, you don’t actually have to go through the trouble of making your own dough and waiting for it to rise; your local pizza place will sell you a delicious fresh ball, no problem (mine charges $4 for a large, which is enough for about three homemade pies!). Empty tomatoes into large bowl and break down with your hands. Heat 1-2 tablespoons of olive oil in a large shallow pan over medium heat. Add shallot and sauté for four minutes or until translucent. Add tomatoes, salt and crushed red pepper and bring to a boil. Turn down heat and simmer for 20-30 minutes until thickened. Separate your dough into softball-size balls, then using your hands or a rolling pin, flatten each ball of dough on a floured surface to the size of your pan/stone. Spread a few spoonfuls of sauce over the dough, scatter slices of mozzarella cheese, then sprinkle with olive oil and salt. Bake pizza about 20 minutes or until bottom is golden brown. Let cool slightly, top with shredded basil, slice into pieces and serve. Slice potatoes very thinly using a knife or a mandoline, then soak in cold water to remove excess starch (they’ll cook faster!). Drain potato slices in a colander, then toss with 1/2 teaspoon salt and set aside for 10 minutes. Dry potato slices with paper towels, then toss with 1 tablespoon olive oil and a sprinkle of crushed red pepper in a medium bowl. Evenly spread potatoes over the dough up to the very edge. Season with a bit of sea or kosher salt, drizzle with olive oil, then sprinkle with rosemary. Let cool slightly, slice into pieces and serve. Sprinkle small slices of taleggio over dough and drizzle with olive oil. 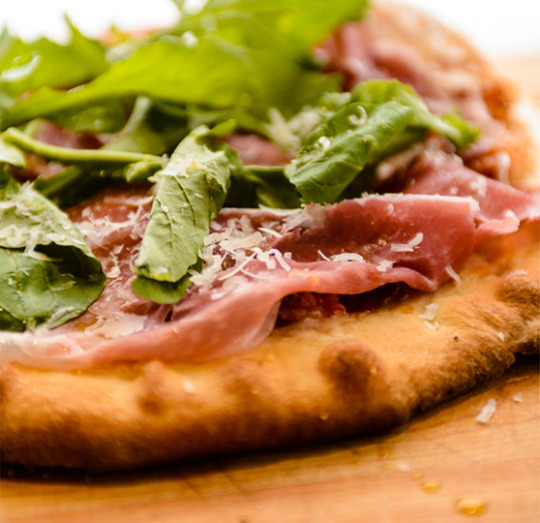 Add prosciutto, arugula and another drizzle of olive oil immediately after removing from oven. This entry was posted in Uncategorized and tagged food, madewell, marcy roberts, recipe. Bookmark the permalink.